The name of this race had new meaning after I finished it. 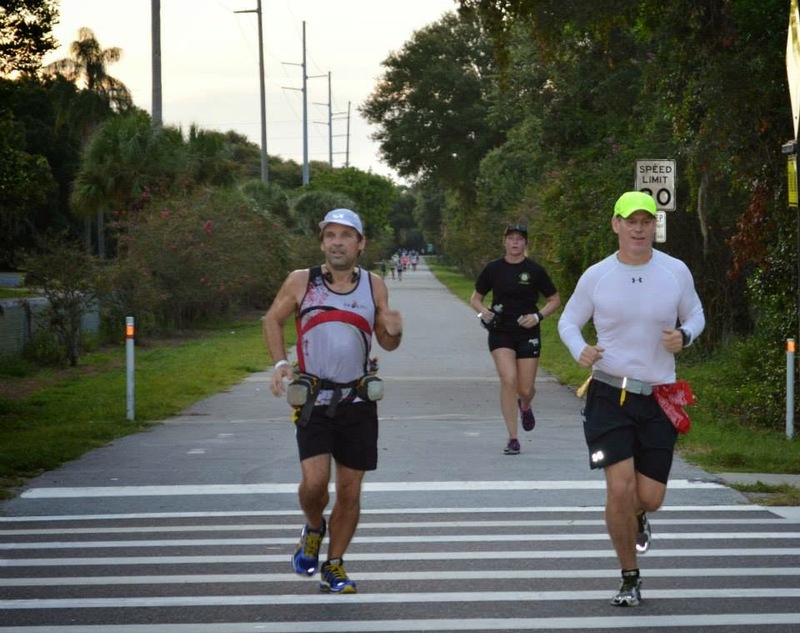 The challenge is to run the entire length of the Pinellas Trail - a seemingly innocent looking rails-to-trails bike/running path which starts in downtown St. Petersburg and finishes in John Chestnut park in Palm Harbor. I've run many sections of this trail, but never the whole thing. Last year only about 14 people participated for its first year. This year they had over 70 people sign up, 58 starters and 39 finishers. Course time limit of 13 hours and a 6:30 start. I talked my friend Joe into giving it a try. Although he'd never run this distance before, he's done well in marathons and is also very mentally tough. I did however underestimate the severity of the heat and humidity. I had reasoned that since I've run the Key 50 mile ultra in May one year and last year did the Western States 100 where it reached up to 100 degrees that this wouldn't be so bad, because it's mainly flat and "only" 46 miles. I figured that a 10:00 pace would be somewhat conservative. Maybe slow down a little at the end or possible speed up if I felt good - at least that's what the plan was. These miles were great, especially for Joe. For some reason my legs felt tired the first mile (slightly uphill the whole way but not by much). I told him we would take a walk break for 1 minute each mile, do that as long as we could until we had to take more walk breaks. He loved that idea. So, things went exactly as planned. We reached the first aid station at 8 miles. Getting a little bit hot but the pace seemed reasonable. First two miles were just under 11:00, followed by a bunch right about 10:00, then 11:00 for mile 8 which included the aid station, followed by 9:21 just after. My dead legs feeling had gone away. Next two miles were under 10:00. Things started to change about mile 12. It was getting hotter and I had a new problem - hip flexors were bothering me. Maybe a combo of the slower pace and more bridges than I had expected. Maybe 6 or 7 so far. About mile 13 I realized that 10:00 was too ambitious for today and we should go with closer to 11:00. So the next few miles were 10:50 to 11:20 range. Miles were getting slower now. At mile 19 Joe wanted me to go ahead. I told him we'd at least go to mile 20 together. When we got to 20 he told me to go ahead. I felt pretty good through mile 21 and reached the next aid station where they had our drop bags. Refilled my bottles there and had an ice pop. I looked in my drop bag, thought about putting on more sunscreen and taking a muscle milk but decided to just go. Miles got even slower but things weren't too bad. At almost mile 25 I stopped in a small store on the trail called the Dunedin Boxcar and bought a bottle of water and a cola (Blue Sky natural soda). The store guy asked if I was running today, yes 46 miles, the whole trail. He gave me a cup of ice for the soda, I dumped the bottled water into my water bottle and went on my way. Just after leaving the Boxcar, I ran into Didi (Joe's wife). He had already texted her that we had slowed down and that I had gone ahead. She had some ice and a cold towel and I took a handful of peanuts which tasted very dry which worried me a little. I had slurped down the cola already and still had the ice cup, so I poured a muscle milk over it. I thanked Didi and then headed out again, but at a walk. With the stop, mile 26 was about 18 minutes, the next mile was 17 minutes. It felt like I'd never run again for the rest of the race. After leaving Didi, I was soon next to Weaver Park. I was walking and not in the best spirits. I had the empty ice cup in one hand and the muscle milk in the other hand. I needed a third hand or at least some place to stop and get myself situated. I looked down the trail and saw Jessica standing there as if she had appeared out of nowhere, holding a banana in one hand and a cold bottle of water in the other hand. Earlier my phone was dying and I had just enough time to tell he I was at mile 20.6 and the battery was dying. So, she had looked up where mile 20.6 was in the race, what time I had sent the text and where she was and decided Weaver Park was the place to be. I think she had arrived about 5 minutes ahead of me. We had a brief hi together and she gave me some encouragement and was also the third hand I needed, pouring the muscle milk into the ice cup and taking the empties from me. She was an example of what another person referred to as a trail angel. It's a person who appears when you need help but wasn't expecting anyone, they just show up, help you out then you are on your way again. After I finished the muscle milk a guy came up behind me, asked how I was doing - hot and tired. He said he had started out too fast, had a rough patch and was better now. Just up ahead he said his friend had an unofficial aid stop with water, ice, beer, and pork sandwiches (it did not sound odd to me at all). He also invited me to run with him sometime - they meet on Wednesday nights at the Tarpon Tavern, he also knew some people from my group as well. Next, from behind comes Oliver. I've seen Oliver at a lot of races - (he's a very tall fit guy and a dead ringer for Yul Brynner as pharoah in the Ten Commandments movie). 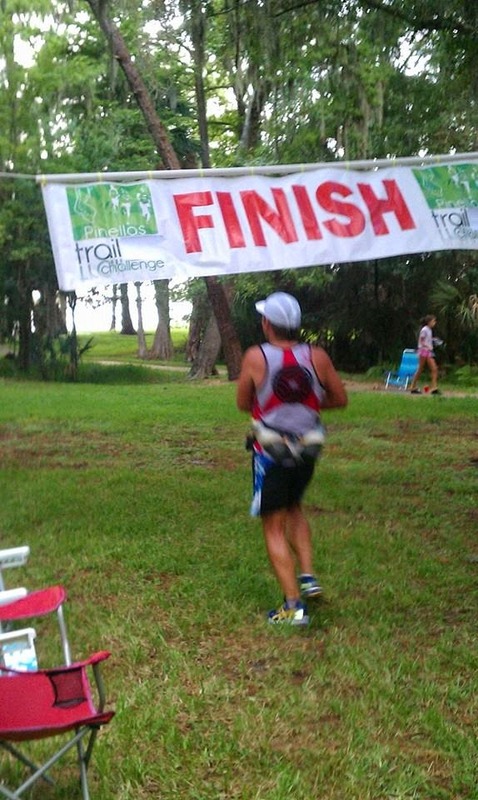 This was his first ultra and he had a goal pace of 12:00 and seemed to be right on track. Finally I started running again after a good two miles of pretty much not running. Actually, these were short bouts of running. Go as far as I could without my heart rate shooting up too high (I was not wearing a heart rate monitor but I could hear the pulse in my ears telling me to slow down). I ran into Joe's brother Tony, said hi to him and told him Joe was maybe 10 minutes back. Went over the last pedestrian bridge for the trail and then saw Didi again, grabbed some more ice, thanked her and went on. There were several miles of mainly open trail and almost no cloud cover. At one point I saw shade from a cloud up ahead but it kept on moving, just staying out of reach. As I got near Wall Springs Park, there were two women and two little girls with an impromptu aid station - ice, water, ice pops and a chair with a shade umbrella. I sat for maybe a minute while they filled up my bottles with water and ice. Got going again with two nice cold bottles against me. Still felt like a long way to go to get to the Tarpon Tavern at mile 36. Stuck for a little bit at the traffic light crossign Klosterman, but once I did was feeling closer - at least no longer impossible far. At about mile 35 another couple had a small aid station. They had fruit, so I at a slice of pineapple which had never tasted so good as this one. They asked how I was doing and if I knew who the president was - I really had to think about the answer and pretended that I was joking when I told them I almost said Bush. And then finally, the Tarpon Tavern aid station, just past mile 36, only ten miles left to go. Joe was there, he had dropped out at mile 29, had eaten lunch and had a beer at the Tavern and was in great spirits. I apologized for dragging him into this but he was ok and having a good time now. I left the Tavern and continued heading north, looking forward to when the trail turned to the east in just a little while. It felt like there was a small rock in my shoe so I stopped at a bench and sat down to check it out. Right calf charlie-horsed on me and I actually screamed a bit and then waited for it to go away. At that point a young lady (later found out her name was Tracy) who was just behind me at the aid station went ahead of me. I followed her for a bit but then she disappeared. Like all the other runners (and volunteers) she was very friendly and encouraging. The trail went under US 19, then headed south a bit, and then east again. I was not looking forward to the stretch on Tarpon Ave with its rolling hills (which although somewhat small would feel like mountains). But soon I saw Joe again and Didi- more water, ice, gatorade and encouragement. As I was moving again I saw a green pickup truck which beeped and then pulled over. It was my long time friend Dixie. He knew I was running today and wanted to find me. He had driven to the finish line, asked about me and was told I had made it through mile 36. He ran with me just a bit and pointed to the hill up ahead and told me the downhill would feel easier and when I turned onto East Lake Road there would be shade. It felt like a blessing of sorts. Shade did not come right away but it did eventually. I also stopped again at someone's SUV and took a banana from them along with some more ice, one last top off. It was another couple of volunteers who were hopping from place to place to help out the runners on the course. I talked to them after the race and thanked them and found out I kind of knew them. Had seen them at other races - the guy is usually about 10 minutes ahead of me at half marathons - super awesome people who know how to give back. 6 miles left, 5 miles left, 4 miles left... These miles felt like I was getting closer but still too far away to feel almost done. Joe intercepted me a few more times but I was pretty well stocked up and hydrated. The last two miles there was some cloud cover with a storm not too far away. And then finally I saw the brown and white sign with the words "TRAIL ENDS"
That was it, I had made it (although still about 3/4 of a mile into the park to get to the finish line). It was great to hang out with the other runners, volunteers and friends. Saw a few more people finish. As I was leaving later, saw a few more people making their way down East Lake, on their way to the end.